WINNING! 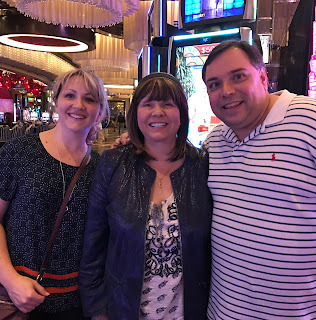 Thanksgiving trip report at The Cosmopolitan and Palazzo! Going to Las Vegas for Thanksgiving this year started out sad as my Mom couldn't join us due to some recent health problems so she stayed home in Fort Lauderdale to celebrate with friends. The good news is that Mom is doing much better and my son and I are going to visit her in Ft. Lauderdale in early January. The original plan was for me to fly in early to meet Mom so I did arrive early on Monday still staying at The Cosmopolitan for 2 nights. My husband Randy would join me Wednesday afternoon with our son flying in late Wednesday night. Randy and I would be staying at Palazzo and our son at Wynn. My flight was on time, the limo driver from Cosmopolitan was waiting for me and so with the help of VIP services I was very quickly checked into my one bedroom terrace with the view of the Bellagio fountains. After unpacking I went to the Identify Player's desk, got my free play put on my card and decided to use some of it on Plants vs Zombies since that had worked out well for me on a previous trip. I had some nice hits and then a decent bonus so it turned out to be a good decision to play it. The rest of my gambling that afternoon was up and down with me mainly staying even. Ken (twoarmedbandito) a friend from the Vegas Fanatics and Joker's Wild Gambling emporium message boards was in town and staying at Aria and he came over to play at Cosmo for a bit. We both tried the new Superman game with Ken doing much better on it then me. 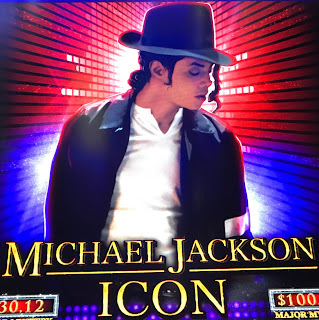 The game has 2 versions and Ken was playing the more volatile version that supposedly has larger pays but less frequent bonuses and I was playing the version that claims to give more bonuses. Of course Ken was getting bonus after bonus on the game that is suppose to have them less frequently while I only had one on mine, LOL, just goes to show if a game or person is in a lucky streak it doesn't matter which version we are playing! I left Superman to play Wonder 4 Jackpots and had a nice win on a Buffalo bonus. While playing I was recognize by Chris and Brandy from the VMB message boards. Last year we had plans to meet up around Thanksgiving but it didn't work out and this year we didn't have plans but ran into each other. Ken who was playing a game nearby took our photo and we had a nice chat. After Chris and Brandy left, I continued to play Wonder Four Jackpots and had a nice bonus on Miss Kitty. I spotted a Irving the Viking game near Wonder Four Jackpots and with Ken watching I tried to continue my personal challenge of getting to the end of the journey in the bonus. Here's the video if you want to see what happened! After Irving the Viking Ken and I said goodbye and I went to meet up with my friend Barrett and his wife Missy. Barrett was my Venetian and Palazzo host many years ago until he quit and moved out east for a while to work in a non-casino business. A couple years ago he returned to Las Vegas and is working again for V/P, but by choice no longer as a host. Last year Barrett and Missy were married and this was my first time meeting her and she is a sweetheart. Lovely fun couple and so well suited for each other! We decided to eat at the Wicked Spoon buffet and it was pretty good tonight. The best station was where they make this seafood dish to order and it's on the upper right above. Mine was shrimp and halibut in a wine, garlic butter sauce. There was additional seafood you can have added to it, like mussels. After the buffet we took a walk around Cosmopolitan and ended up at the ice skating ring. Everyone was having a good time and you could rent a fire pit seating area if you wanted. Food and of course beverages is available. It was cold out there and I was wearing sandals so we returned inside to finish our walk and for me to give them a tour of my room and to admire the view. After Barrett and Missy left, I won and I lost, basically continuing to stay even for the day/night which some of you know can be considered a win, LOL! I even tried Megabucks and had a couple small hits on it! Cosmopolitan's Mega Buck machines have different themes and my favorite is the one below with the respin feature. Last couple trips I have enjoyed Money Deluxe which cooperated again with a couple nice wins! 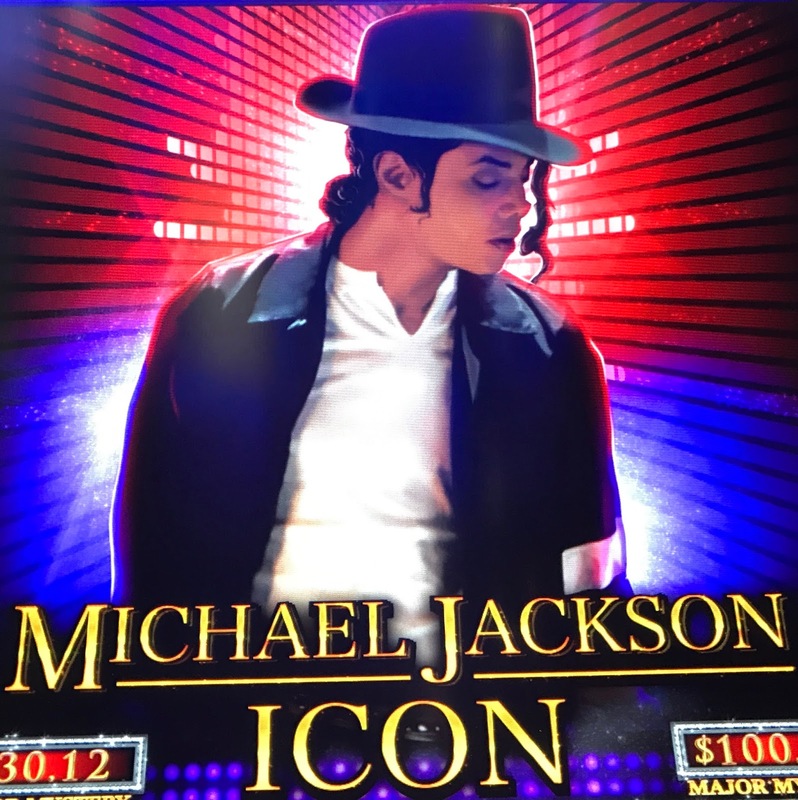 After my nice bonus on Michael Jackson Icon I was recognized by the lady sitting next to me. 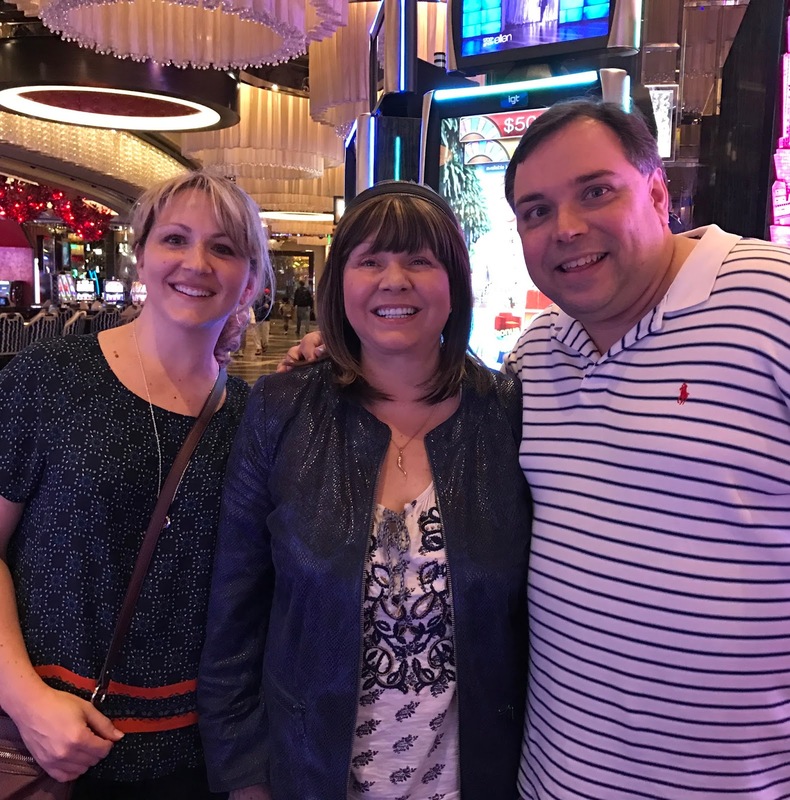 It was great to meet and chat with Susan from Texas! After chatting with Susan I played a few games nearby and lost on them so I wandered over to the High Limit area and decided to play Valhalla, which is just outside the HL room. You can set the denomination to nickels, quarters or dollars. I went with quarters and had a great bonus! Here's the video if you want to see it.